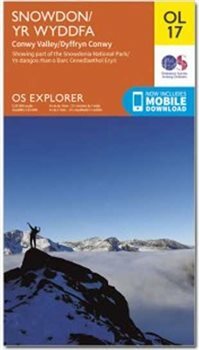 Map sheet number OL17 in the OS Explorer map series is the ideal map for exploring the mountain scenery in Snowdon. This area, famous for its fantastic walking routes, is home to the highest mountain in Wales. Take one of the six well mapped routes to the summit of Mount Snowdon and enjoy the views! Snowdon has the perfect mountain form, with textbook glacial corries and knife-edged aretes. Snowdon has big paths, which can get overcrowded in summer, but when you turn your back on the new cafe complex and look across the horizon of a hundred hills youll know why you came. The view from the summit shows the difference between the north and south faces of the range. Y Lliwedds north face is hung with cliffs and gullies, but in contrast the south faces of Carnedd Ugain and Crib Goch are pallid and barren, consisting of dusty pink screes and broken rock. Snowdon is at its most rugged when its flanks coincide with the top of the Llanberis Pass. Here, huge glaciers, which were slow to melt on the shady side of the mountain, scoured out the gorge, leaving a devastation of boulders and severe precipices which must have struck fear into the early traveller. Highlights: Snowdon (Yr Wyddfa), Llanberis Path, Conwy, The Menai Strait and Colwyn Bay, Llandudno, Beddgelert, Conwy, Bethesda, Betws-y-Coed, Bangor and Caernarfon. Also includes other popular landscape features in the Snowdonia range such as Carnedd Llewelyn, Carnedd Dayfydd, Glyder Fawr, Glyder Fach, Tal y Fan and Tryfan.